From France by way of New Orleans. You can buy your shrimp already cooked to save some time and effort. But if you are from New Orleans, you have very specific ideas about what to do with raw shrimp. You can even buy prepackaged remoulade at Carrefour. (You wouldn't do that, would you?) Here's Cathey's take on the entire process, guided by her favorite chefs. Pulse first 4 ingredients until finely chopped in food processor. Drain or dry with a paper towel. Add remaining ingredients and pulse until well combined. Chill several hours. Wrap seasoning in cheesecloth and secure with kitchen twine. Place the spices, 1 gallon water, salt, lemons, cayenne, garlic, and onion in a large pot (squeeze the lemons over the water as you throw them in), and bring to a boil. Reduce the heat and simmer 10-15 minutes. Return the heat to boiling and add shrimp. Cover and remove from heat. Let stand 10 minutes or until shrimp are cooked through. Drain and place on baking tray until room temperature. Refrigerate until ready to serve. 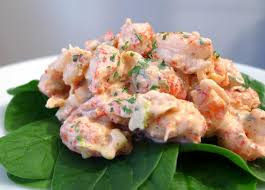 Mix with the Shrimp with the Remoulade and place on a bed of greens. FOR MORE FOODIE INFO, VISIT HERE.